My story. After growing up in Norfolk the flattest part of the UK, I developed a love of the mountains through white water canoeing and climbing. After college studying outdoor education I started work at a centre in Snowdonia teaching canoeing which also had a dry ski slope. As I don’t like watching TV, most evenings were spent on the ski slope improving my technique and doing a bit of teaching. When the chance came to work in scotland as an apprentice ski instructor I jumped in with both feet. That was 30 years ago, and I haven’t looked back since having worked for ski schools in Andorra, France, Switzerland, Italy and Austria. I also worked for a major tour operator for several years which made me realise there is more to a ski holiday than great skiing. Good food, comfy accommodation, and good friends all help. I have 20 chickens and 5 ducks in my garden in Wales. I enjoy teaching nervous skiers helping people enjoy there time in the mountains no matter there ability. And of course bumps and Powder. Always make sure you are comfy, nice and warm, especially hands and feet. It’s so hard to concentrate when you are uncomfortable on the mountain. 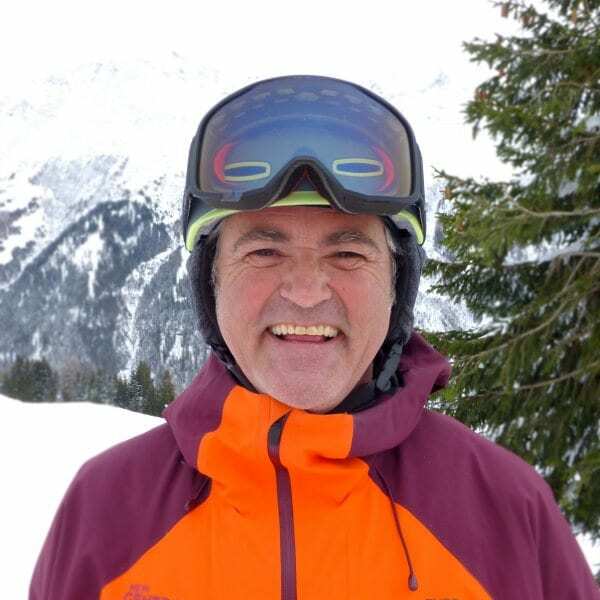 Fancy a private lesson with Jim on your next holiday?